Urban Muser: Happy Purple Tuesday! I had a little time before heading off to work today so I thought I would try to take a Purple Tuesday photo and join the fun since I haven't submitted anything in weeks. When I came up short of any fun purple around my apartment (it's too cold to go outside!) I decided to create my own purple haze. It's sort of cheating, but it's what I've got so I am sticking with it!! As usual, The Cat made me crazy with her attempts to get into the action. Here are some of her best out-takes. 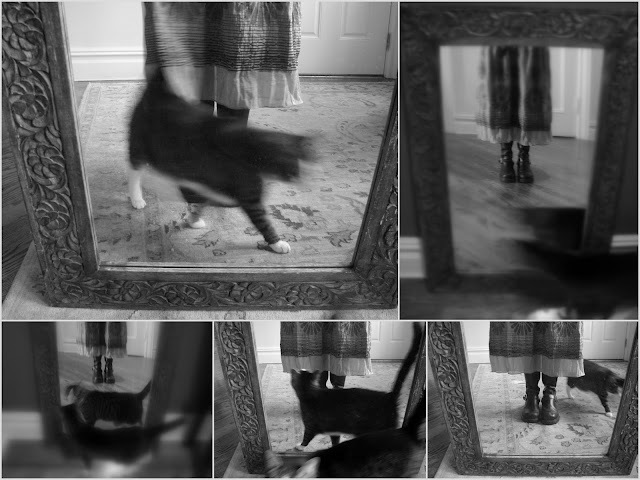 lovely shots, like how the cat wanted to get involved. oh I love this!! so fabulous!! Those are the BEST boots. I LOVE it. You are so creative and fun always. You give me lots and lots of ideas. Hope you are having a very happy Tuesday! Have a happy Purple tuesday too. Happy Holidays! Love how this is edited.. Happy Purple Tuesday to you! Your cat is too cute.. I could use a little purple in my life. Right now, everything is a sea of blacks! The kitty outtakes are hilarious! Somebody wants attention ;o) Thanks for joining up on Communal Global! Love the skirt, boots, rug, mirror and kitty cat. I love that you listened to Tim Gunn and "made it work"
Sigh. Cats and photos. I think I am doomed to never take a cat-free picture of my knitting again. Love the pix you posted today! Gorgeous! Especially the first shot. Just love it! The first shot is fabulous, even if you're a cheater. ;) Love that you included the kitty out-takes, that is sooooo real life! I think that first shot is great, too! Love the boots! Love all of these, and i agree, your work is very creative. Do you mind sharing how you make your mosaics? i love the cat in the pics!! Ohhhman, I LOVE that mosaic you put together! Great images. I'm really digging your collage - I love your cat in the pics! heehee, love that your kitty is in on the action. those shots are so fun all together.